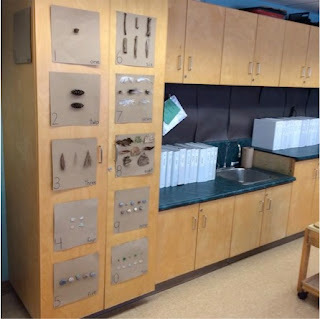 This post is adapted from a presentation given by myself and my teaching partner Shelagh Saunders in May of 2015 at a Kindergarten Leaders Inspiring Visions of Excellence session. Before examining the many benefits of focusing on building a sense of community, I feel it's important to come to a shared understanding of what community means, by hearing from multiple voices. 1) a group of people living in the same place or having a particular characteristic in common. 2) a feeling of fellowship with others, as a result of sharing common attitudes, interests, and goals. 3) a group of interdependent organisms of different species growing or living together in a specified habitat. A classroom community provides equal voice to all involved – teachers, students, families. Each member’s unique perspective is honoured, valued, celebrated, and reflected in our space. 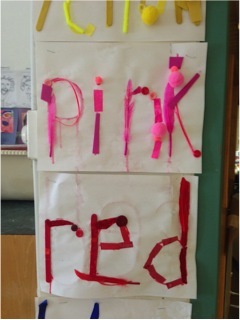 As a learning community, the focus is not on arbitrary rules and discipline, but on co-created expectations, self regulation, teamwork, mutual respect, and accountability. Community members are viewed as confident and capable and are able to gain independence in navigating social interactions with their fellow community members. Time is given to academic learning that occurs in school, but equal time is given to building and maintaining, this community. As a community we talk about our feelings, and as often as we can, we dance, we play, and we laugh. 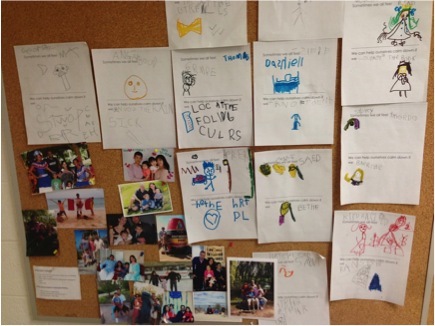 In addition to the aforementioned points, I feel that community is important in a classroom as conversations about big ideas such as respect, responsibilities, and roles tend to go hand in hand with community – and this only makes our job easier! When focus is given to building community, students have a vested interest and pride in caring for each other and for the space (i.e. tidy up becomes less about arbitrary rules and more about the responsibility of members within a community). Differences are celebrated. Students feel confidence about who they are as humans and as learners, which trickles down to the “academics”. Students feel valued, safe, and supported. They feel comfortable making mistakes and look at themselves with a growth mindset. So - given that creating a community within your classroom is so beneficial, how do we go about doing so? I'll now share some specific examples of what we've done in our own experience and how it unfolded in the context of community building. 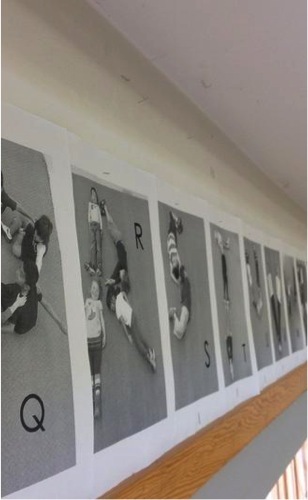 I interpret this as an important reminder to start the year with your space as a blank canvas, to be filled by the unique individuals that enter your room – this removes ownership of room from solely the teacher(s) and establishes it as a place that belongs to and reflects ALL community members. 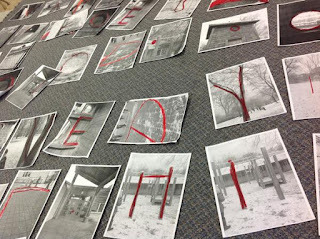 Students take pride in filling the space with their work, and see relevance of what’s posted, therefore gaining a deeper understanding than they may with store bought posters and cartoon borders that are “just there”. I always like to imagine a student giving a room tour to someone entering our space for the first time. I ask myself – would the student know what everything on the wall is? Would they be able to explain the process behind it? Can they articulate why it’s posted? If not, I consider that time to reflect on what’s up on the classroom walls. 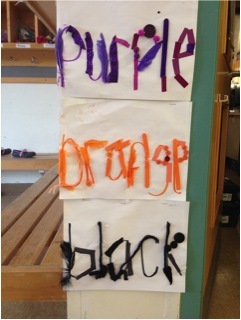 Here are some photographs of letter panels, number panels, and colour word panels that were created by students in our community. We believe (and saw!) 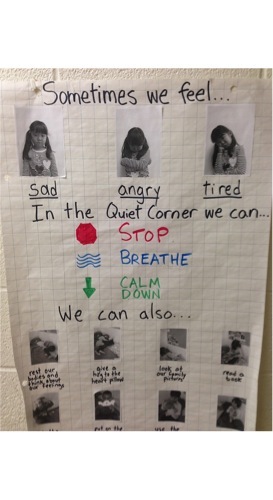 a deeper understanding of these concepts when students went through the process of creating them themselves. Students independently knew where in the room to go for anchors when they needed to find a letter, number, or colour word. These panels weren't store bought and slapped up by me in late August - but rather created at the forefront of students' active learning, providing them with a relevant and holistic understanding in a way that they could take ownership of in the end. In order for students to feel like valued members of the community, we need to give them the chance to explore skills and knowledge necessary to self regulate. Self regulation is linked to the idea of creating a learning community because it’s rooted in respect and understanding, while valuing where the child may be, rather than where we think they should be or how they should act. It empowers students as functioning members of our communities and removes educators from the role of “policing behaviours”. Students gain a self image of themselves as autonomous members of the community who are able to make decisions based off what they feel/need without a teacher being "the boss". In our space, we worked to implement several different tools and strategies, which are visual and tangible reminders for the students to engage in the act of self regulating their emotions, needs, and actions. Some specific examples are below. We use a rainstick to signify transitions in our community. 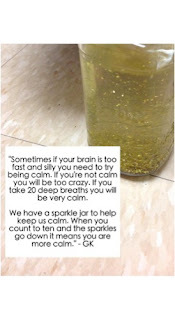 Students created their own personal rainsticks to take home and continue exploring how they can be used to self regulate. Students created a community Talking Stick in an effort to create a space where all members felt their voice could be heard. Our Quiet Corner provides students a quiet and calm place should they need it. Some documentation found in our Quiet Corner. 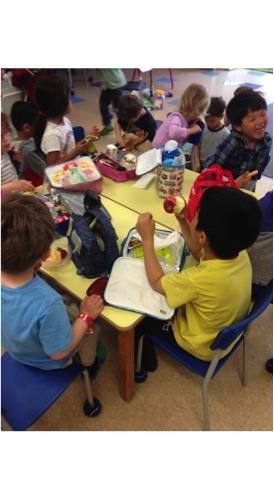 Rather than a group snack time, we build it in as a learning centre, which encourages students to listen to their own needs and act accordingly. 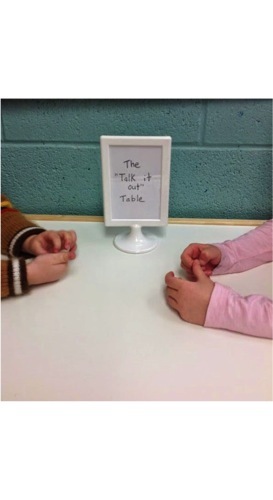 The Talk It Out Table provides students with a place to work through social conflicts in a respectful and effective way. Click here to see the blog post detailing the Talk It Out Table. The Sparkle Jar (adapted from the Minds Up curriculum) provides students with a visual representation of their current energy level or emotional state. So, where do we come in as educators and what can we do to actively shape a sense of community within our classrooms? To put it simply, we need to make time for community building. Community doesn't build itself. Dedicated time and effort needs to be given not only to build a classroom community, but also to maintain it. I believe that this should be of equal value and importance as academic matters. In fact, at the start of the year, I would argue that this needs to be more important than "getting to the academics". Remember, social learning is an important form of learning, and engaging in "meatier" forms of academics without the basic foundations of a respectful community can be extremely difficult. A huge part of this is recognizing that we as educators aren't the boss or leader of this community, but rather a co-learner positioned alongside the students - and our learning is reciprocal and ongoing. We've implemented a few specific strategies that we feel, in our role as educators but also members of the classroom community, have allowed us to cultivate a growing sense of community amongst the students and ourselves. 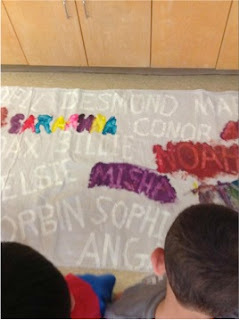 As often as possible, we try to provide opportunities to work together on collaborative art projects based on student interest. These projects allow community members to work together towards a common goal by adding their own individual marks. 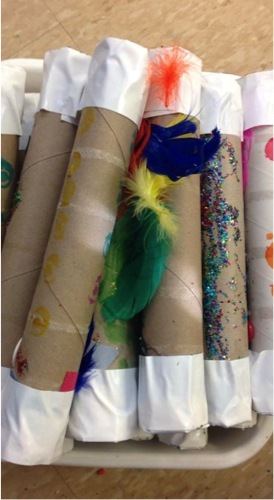 A few of our community's collaborations are pictured below. We also have dedicated whole group meeting time. Yes, it's known and understood that Kindergarten students benefit greatly from small group learning opportunities, but I feel strongly that also providing whole group experiences as vital in coming together and feeling like a community. 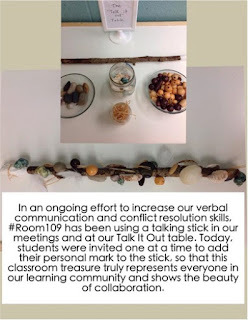 We use our talking stick, and once a month provide all community members with the opportunity to discuss what they like about our classroom, but also what they want to see changed. These discussions have been so rich, and giving a voice to ALL community members (not just teachers) about how we set up our space has been eye opening. Also, and this will come as no surprise to anyone who has visited our space, we have lots and lots of dance parties. On the surface, it looks like just a lot of fun (and it is!) - but it's actually so much more and done for a very purposeful reason with regards to community. These moments of celebration and exploration strengthen the bonds of our community, and provide a joyful moment for all members in which they are free of any expectations or criteria. 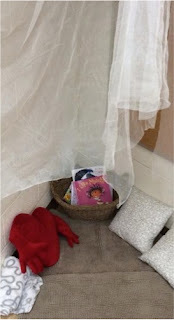 It is my hope that you find our specific examples of how we've shifted from looking at our space as a classroom to looking as it a community have been helpful. It seems like a small distinction in words, but hearing students speak about the value of community towards the end of our year together, I knew exactly why it's so important to me. As we look forward to the start of a new school year, I hope to continue considering how to function as a community of learners, and I encourage all educators to do the same. Joel, you have so eloquently captured something that I feel so passionately about too. The way that you respect, honour and listen to your students, teaching partners, and families is beautiful. Taking the time and allowing ourselves permission to work on and build this sense of community is so critical throughout the year. Further to that, creating community isn't something that you can do overnight or by doing "x, y, and z". It is truly a way of being with children that takes time, patience, and a willingness to be vulnerable. I love that you understand the value of academic learning, but yet equally value personal and social development of young children. Thanks for letting us into your head and your learning environment. This post is so detailed and a helpful reminder about the importance of something that builds the foundation to a strong classroom. Thank you so much for the kind works Tracy - means a lot coming from you, given how much I look up to you as an incredible educator. For me, I would honestly rank community building as one of the very most important elements of teaching. I am glad that came through! This was inspiring to me, Joel. Good to see your work and dedication. I am an early childhood educator in Regina, Sask. 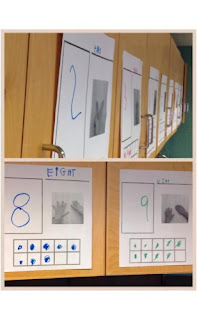 I have an early childhood blog, as well, although haven't posted for some time. I love the other early childhood bloggers I met online through this. I have worked in the field for 27 years, and think I too am a life long learner, I never stop being interested in learning good ways to teach young children. I think I'll subscribe so I can continue to follow along with your work. Thank you so much for the positive comments - very much appreciated. I love your comments about being a life long learner. That is so incredibly crucial in our field, and something I hope to never lose sight of. Thanks again! How can I subscribe to your blog, Joel? Not 100% sure, but I think you can do that from your dashboard in Blogger. Let me know if that works, and if not I will investigate further. This is wonderful, Joel - so many simple lessons to learn about how we form community that will last for a lifetime. And that's the beauty of it - they are just as applicable to the spaces we live and work in as adults. I will be sharing about your post with our church family at Saugeen tomorrow. Chi Miigwetch!! Joel, I really appreciate you sharing your thinking and inquiry into building a sense of belonging and community with your children. Lots of provocations here for me - thank you from Adelaide, South Australia! Wow! Glad to hear it resonated...all the way on the other side of the world! Thank you for your comment. Your reference to the dance parties you make space for in your classroom made me think about Malaguzzi's zebra in the poppy field. Do you know this story from 100 Langs? Malaguzzi wanted the zebra (Diana School mascot of sorts) to surprise the children during their poppy flower study in the field. The teachers argued that the zebra would distract the children from their observations. 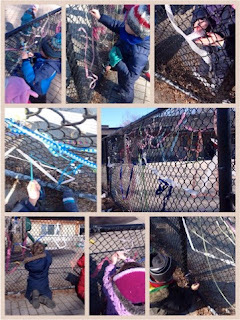 But Malaguzzi pushed: the children need surprise and wonder because these (and other) emotional experiences create and inspire community and closeness amongst the children. Dancing does too! Beautiful blog. I relished it!